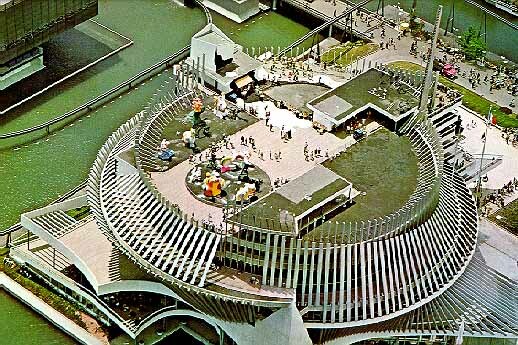 The French pavilion's large concrete and steel structure was wrapped in a shimmering row of tall aluminum fins. Inside its eight levels of technological and artistic displays converged towards a central well where the "polytope", an electronic light display, sent flickering flashed of color racing up and down steel cables to the sound of ultra-modern music. An on its rooftop terrace, which offered exceptional views of the entire Exhibition, were Niki de Sainte-Phalle's colored sculptures. 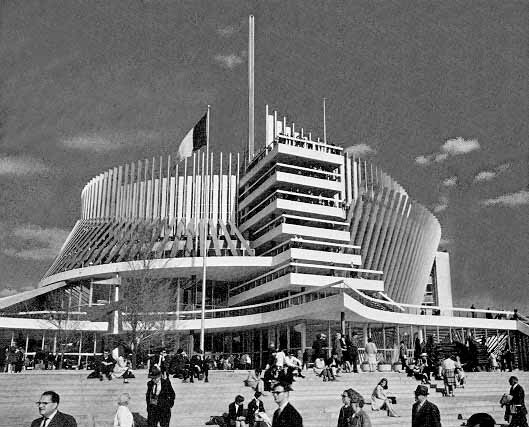 The French pavilion's tall concrete and steel structure was wrapped in a shimmering row of aluminum fins. The theme of the French pavilion was Tradition and Invention. In the three levels above the ground floor, the country showed the extent of their progress in technology and science. There were exhibits of atomic reactors, new techniques for deep-sea oil prospecting, desalinization of water, tidal power experiments along the Rance estuary, the largest linear-power molecular laser that could melt glass, and a model of the bathysphere "Archimede". If the French manufactured something, did research in a field, or planned future technological projects, they overwhelmed the visitor with their technical skills. They had a television studio where programs where taped using the SECAM process and shown on French color TV. The pictures were definitely sharper than American television. 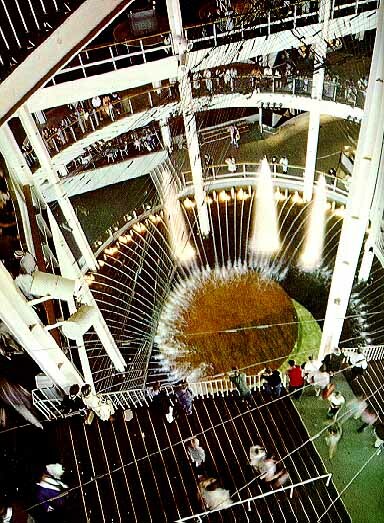 The interior well of France's pavilion. The pavilion's fourth level featured eight cinemas covering present day French sites. The films took the visitor all over the country. A miniature "son et lumiere" display around the model of the Chateau Chambord brought back to life Francis I's magnificent folly. The two upper levels presented an awesome collection of paintings, sculpture, stained glass windows and other forms of art from the Romanesque era to the 20th century. Another section of the museum showed the art of craftsmen; elegant furniture, jewels, cut-glass and tapestries. An exhibition of books presented 200 French poets, novelists, essayists, dramatists and historians. Ten booths allowed one to hear nearly 80 recorded voices of literary greats. There was also a large exhibit devoted to Franco-Canadian friendship since Canada's first European colonizers were French, and their descendants made up one-third of the Canadian population. There were 165 original documents illustrating the first two centuries of the New World. There was a magnificent Renaissance world globe etched in copper (Rouen globe) with the North American coastline in Jacques Cartier's time. On display was also the explorer's own account of his second voyage to Canada, and the first map of Montreal drawn up in 1702. The French pavilion's rooftop garden featured Niki de Saint-Phalle's colored sculptures. The City of Paris had its own exhibit on the ground floor of the French pavilion. A French documentary by Francois Reichenbach was made especially for Expo and was simultaneously projected on four screens. It gave one the impression of strolling through the French capital, from the Eiffel Tower to the Trocadero, then to the Opera House and Place de la Concorde. The Tulleries and the Champ-Elysees came into view followed by Montmarte, the Latin Quarter and Saint-Germain-des-Pres. 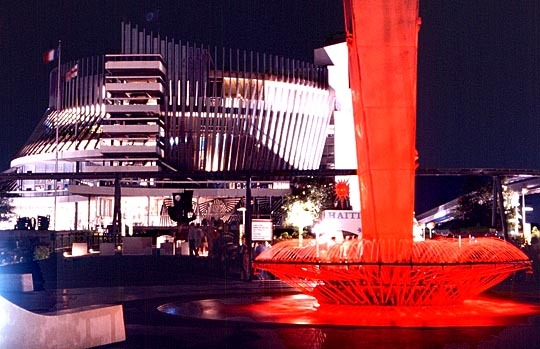 The French Pavilion at night.